The Solar System Observer’s Guide (ISBN 0540088277) is one of many of the great astronomy books from Philips. The book is around 250 pages long, with some great colour astronomy photos throughout and the book is thoroughly readable. Solar System Observer’s Guide begins with a basic introduction to our solar system and how the human eye works. You are also introduced to the various types of telescope and how they work as well as how binoculars work. There is also some information on astronomy drawing, using a web cam and astrophotography. Each chapter in turn then covers the planets in our solar system including (in order in the book) Mercury, Venus, Mars, Jupiter, Saturn, Uranus, Neptune and Pluto. Each chapter gives you full data about each planet including its orbit and about the globe, as well as how to find the planet in the sky and what you will see in your telescope. Each chapter gives you a great introduction about each planet with many of the colour photographs included being taken by named astronomers. After the planet chapters there are chapters on comets, meteors, our moon, the sun and about aurorae. 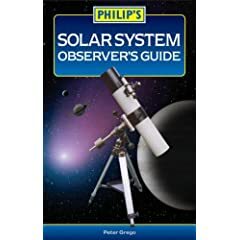 If you are after a handy sized book which gives you a general introduction to the solar system then consider the Solar Systems Observer’s Guide. This book would also make a great astronomy book purchase for a child’s school project, especially at the prices that Philips charge for their books.